Monocytes are leukocytes that play key roles in inflammation, pathogen challenge and homeostasis. They originate from progenitors in the bone marrow and travel through the blood stream to peripheral tissues. At the site of infection or injury in tissues, they can differentiate into dendritic cells or macrophages that mediate both innate and adaptive immune responses to disease. Monocytes demonstrate extensive plasticity and heterogeneity, and adjust their functional phenotype in response to immunological cues. They are critical cells in the maintenance of human health and have been the focus of intensive research since the 1880s when their phagocytic ability was first described by Ilya Metchnikoff. In this review, we characterize the main human and mouse monocyte subsets and their function, describe the process of monocyte recruitment and differentiation as well as highlight the role of monocytes in disease. Monocytes are an evolutionarily conserved subset of white blood cells that originate from myeloid progenitors in the bone marrow. They represent 4% of the white blood cells in mice, and 10% in humans (van Furth R and Sluiter W 1986), with a considerable number of monocytes in the spleen and lungs that can mobilize to other tissues (Swirski FK et al. 2009). Monocytes are rapidly recruited to tissues during infection and inflammation, where they differentiate into macrophages or dendritic cells (DC). Their phagocytic ability was first demonstrated by Ilya Metchnikoff in the 1880s, and since then they have been shown to be indispensable in the immunological defense against pathogens (Karlmark KR et al. 2012, Nathan CF 2008). They also play a key role in the maintenance of homeostasis. However, while monocytes are necessary for eliminating invading bacteria, virus, fungi and protozoans, they can also have negative effects on the pathogenesis of inflammatory and degenerative diseases. Accordingly, they are considered key therapeutic targets for disease treatment. Monocytes are members of the mononuclear phagocyte system (MPS), which is a comprehensive classification of all highly phagocytic mononuclear cells and their precursors (van Furth R and Cohn ZA 1968, van Furth R et al. 1972). It comprises all myeloid immune cells other than polymorphonuclear granulocytes. However, the origin and lineage of the cells in the MPS remained poorly understood until the availability of multi-color fluorescence activated cell sorting, which allowed identification of progenitors and differentiated cell populations based on the expression of specific cellular markers (Geissmann F et al. 2010). Current models of monocyte differentiation propose that circulating monocytes originate from hematopoietic stem cell (HSC)-derived progenitors with myeloid restricted potential (Geissmann F et al. 2010). Subsequent commitment steps during monocyte differentiation in the bone marrow involve common myeloid progenitors (CMPs), granulocyte-macrophage precursors (GMPs) and macrophage and DC precursors (MDPs) (Fig. 1) (Geissmann F et al. 2010). Adoptive intra-bone marrow transfer experiments in mice established MDPs as legitimate originators of monocytes, showing that in addition to monocytes they give rise to classical DC (cDC) and plasmacytoid DC via common DC precursors (CDPs) (Ginhoux F and Jung S 2014, Fogg DK et al. 2006). MDPs are characterized as lineage negative (LIN-), CD135 (also known as FLT3) positive, CD117 (also known as KIT) positive and CD115 (also known as CSF1R) positive. Another bone marrow precursor called the common monocyte progenitor (cMoP) was recently identified (Hettinger J et al. 2013). It was shown that cMoPs give rise to monocytes and their derivatives, but do not generate plasmacytoid DC or cDC. Phenotypically, cMoPs differ from MDPs in that they do not express CD135 (Hettinger J et al. 2013). Figure 1 demonstrates monocyte differentiation in mice. Development of monocytes occurs during embryonic and adult hematopoiesis as well as under inflammatory conditions (Robbins CS et al. 2012, Ginhoux F and Jung S 2014). Following development in the bone marrow, monocytes enter the peripheral blood stream, and around three days later, migrate to peripheral tissues, as a consequence of homeostasis and inflammation (Stefater JA et al. 2011). In tissues, monocytes differentiate into a range of macrophages or DC upon exposure to local growth factors such as pro-inflammatory cytokines and microbial compounds (Tacke F and Randolph GJ 2006). Fig. 1. Monocyte differentiation in mice. Adapted from Geissmann F et al. 2010 and Ginhoux F and Jung S 2014. HSCs, hematopoietic stem cells; MP, myeloid committed precursor; MDP, macrophage and dendritic cell precursor; CDP, common dendritic cell precursor; CMoP, common monocyte progenitor; CD103+ IpDC, CD103+ lamina propria dendritic cells; CX3CR1, CX3C-chemokine receptor 1; TipDC, tumor necrosis factor (TNF) and inducible nitric oxide synthase (iNOS)-producing dendritic cells; MDSCs, myeloid derived suppressor cell; PDC, plasmacytoid dendritic cells; cDC, classical dendritic cells. Human peripheral blood monocytes are defined by their expression of the cell surface markers CD14 (LPS co-receptor), CD16 (Fc gamma RIII), CD64 (Fc gamma RI) and the chemokine receptors CD192 (also known as CCR2) (a key mediator of monocyte migration) and CX3CR1 (fractalkine receptor) (Shi C and Pamer EG 2011). There are three different subsets of human monocytes: classical, intermediate and non-classical (Table 1). These subpopulations can be further characterized by different levels of human leukocyte antigen - antigen D related (HLA-DR) (highest level on the intermediate population) and CD195 (also known as CCR5), as well as the receptors TNFR1 (CD120a) and TNFR2 (CD120b). TNFR1 expression is higher on intermediate monocytes, followed by classical and then non-classical monocytes. In contrast, TNFR2 is expressed higher on non-classical monocytes, followed by intermediate, with the lowest expression on the classical subpopulation (Hijdra D et al. 2012). Mouse monocytes also have three subpopulations (Table 1), defined by their cell surface expression of Ly6C (also known as Gr-1), CD43 (Ziegler-Heitbrock L et al. 2010), CD11b and chemokine receptors CD192 for trafficking and emigration (Tsou CL et al. 2007) and CX3CR1 for neovascularization (Kumar AHS et al. 2013). Although the expression of chemokine receptors helps to define mouse monocyte subpopulations (classical versus non-classical), the high level of CD115 expression facilitates discrimination between blood monocytes from granulocytes and lymphocytes, which also express CD11b (Mac-1). Additional markers such as the well characterized macrophage marker F4/80 are also expressed at low levels on monocytes (Francke A et al. 2011). Monocytes are central cells in the immune system that have key roles in maintaining overall health and responding to pathogenic infection. They primarily function as mediators of inflammation however; they also serve as a source of macrophages and DC in circulation and in tissues. They demonstrate high phagocytic capability for removing infected and dying cells, and play a role in adaptive immunity either by directly activating T cells or differentiating into macrophages and DC that are capable of inducing CD8+ T cell proliferation and regulating the activation of CD4+ T cells (Geissmann et al. 2003). During infection, monocytes are recruited from the bone marrow to infectious or inflammatory sites where they initiate antimicrobial activity or promote adaptive T cell responses (Serbina NV et al. 2008, Shi C and Pamer EG 2011). Monocytes can also be recruited to tumor sites where they can mediate anti-tumor defense mechanisms (Peranzoni E et al. 2010). Therefore, the ability of monocytes to traffic to tissue sites is central to their functions in immune defense. Monocyte recruitment and trafficking is primarily mediated by the interaction of chemokine receptors and adhesion molecules, expressed on the cell surface of monocytes, with their corresponding binding partners. Below we highlight the chemokine receptors and adhesion molecules involved in this process split between the recruitment of classical versus non-classical monocytes. The findings discussed primarily relate to mouse monocytes, as monocyte recruitment is primarily studied in mice. However, the similarities between mouse and human monocyte subsets indicate a conserved system and the studies conducted in mice are useful for understanding human monocyte biology (Geissmann F et al. 2003). The majority of circulating monocytes belong to the classical subset, and they selectively traffic to sites of inflammation (Geissmann F et al. 2003). CC-chemokine ligand 2 (CCL2; also known as MCP1) and CCL7 (also known as MCP3) bind to CD192 to facilitate the emigration of Ly6Chi monocytes (Tsou CL et al. 2007) from the bone marrow to tissues. Deletion of either Ccl2 or Ccl7 in mice results in a 40-50% decrease in monocyte recruitment during infection, indicating that they are necessary for monocyte trafficking during pathogen challenge (Jia T et al. 2008). The exact mechanism of CCL2 and CCL7 mediated monocyte recruitment is unclear; however, it has been proposed that IL-23 expression is needed for CCL2 and CCL7 mediated recruitment of inflammatory monocytes to the spleen during bacterial infection (Indramohan M et al. 2012). Monocytes also express CD191 (also known as CCR1) and CD195, which bind to a number of chemokines including CCL3 and CCL5 (Mack M et al. 2001, Kaufmann A et al. 2001). In vivo depletion of CD195 and CD191 demonstrates that these chemokine receptors have non-redundant roles in recruitment of inflammatory monocytes (Eis V et al. 2004, Braunersreuther V et al. 2007). Recruitment of Ly6Chi monocytes to atherosclerotic plaques in a mouse model of atherosclerosis was shown to be mediated in part by CD195 as well as CD192 and CX3CR1 (Tacke F et al. 2007). Determining the role of CD191 and CD195 in monocyte recruitment is however complicated by the fact that unlike CD192, these chemokine receptors are expressed on a wide range of cells (Shi C and Pamer EG 2011). Therefore, it is possible that alterations in monocyte recruitment observed in CD191- and CD195-deficient mice could be a consequence of effects on other cell populations that express these receptors (Shi C and Pamer EG 2011). Non-classical monocytes account for 40% of the circulating monocytes and primarily patrol blood vessels and enter non-inflamed tissues. Under inflammatory conditions, they are recruited to the infection sites earlier than classical monocytes (Auffray C et al. 2007). They primarily respond to CX3CL1, the ligand for CX3CR1 that is expressed on monocytes. Expression of CX3CL1 can be detected in the marginal zone of the spleen during infection, and it has been shown that this mediates early recruitment of Ly6Clow monocytes to the spleen. Deletion of CX3CR1 results in reduced patrolling of Ly6Clow monocytes and decreased recruitment of Ly6Chi monocytes to the spleen during bacterial infection (Auffray C et al. 2009). CD195 also plays a role in the recruitment of Ly6Clow monocytes. In an atherosclerosis mouse model, recruitment of Ly6Clow monocytes was shown to be partially dependent on CD195, which was highly upregulated in this monocyte subset. Other chemokine receptors that have been shown to be involved in recruitment of both classical and non-classical monocytes include CD196 (also known as CCR6), CD197 (also known as CCR7), CDw198 (also known as CCR8), Duffy antigen receptor for chemokines (DARC) and CXC-chemokine receptor 2 (CXCR2). However, they are less studied and further research is needed to fully understand their role in monocyte trafficking during infection and inflammation (Shi C and Pamer EG 2011). Monocyte recruitment and trafficking also depends on the expression of integrins and other adhesion molecules on activated endothelial cells (Ley K et al. 2007). For example, Ly6Chi monocytes have been shown to express P-selectin glycoprotein ligand 1 (PSGL1), L-selectin (also known as CD62L), lymphocyte function-associated antigen 1 (LFA1; also known as αLβ2 integrin), macrophage receptor 1 (MAC1; also known as αMβ2), platelet endothelial cell adhesion molecule 1 (PECAM1) and very late antigen 4 (VLA4; also known as integrin α4β1). All of these molecules contribute to monocyte adhesion and migration (Shi C and Pamer EG 2011). Monocytes also express the leukocyte adhesion molecule CD226 (DNAM-1; also found on NK cells, T cell subsets, mast cells and platelets), and interaction of this molecule with CD155 (expressed at junctions on primary endothelial cells) regulates monocyte migration through cell junctions (Xu Z and Jin B 2010). Table 2 summarizes the adhesion molecules and chemokine receptors involved in monocyte recruitment as well as their corresponding binding partners. Adapted from Shi C and Pamer G et al. 2011 and Kalmark KR et al. 2012. CCL, CC-chemokine ligand; CCR, CC-chemokine receptor; CX3CL1, CX3C-chemokine ligand 1; CX3CR1, CX3C-chemokine receptor 1; CXCR2, CXC-chemokine receptor 2; GLYCAM1, glycosylation-dependent cell adhesion molecule 1; ICAM1, intercellular adhesion molecule 1; LFA1, lymphocyte function-associated antigen 1; MAC1, macrophage receptor 1; MADCAM1, mucosal addressin cell adhesion molecule 1; MIF, macrophage migration inhibitory factor; PECAM1, platelet endothelial cell adhesion molecule; PSGL1, P-selectin glycoprotein ligand 1; VCAM1, vascular cell adhesion molecule 1; VLA4, very late antigen 4; MCP, monocyte chemotactic protein; RANTES, regulated on activation, normal T cell expressed and secreted; MIP, macrophage inflammatory protein, DNAM-1, DNAX Accessory Molecule-1. Monocytes play critical roles in the maintenance of health. Consequently, the increased production or absence of monocytes results in disease. Monocytosis is defined as an increase in absolute blood monocyte count to more than 800/µL. The increase in the proliferative activity of monocytes in the bone marrow, in response to inflammation, leading to monocytosis, was first reported in the 1970s (Meuret G et al. 1974). It is now known that monocytosis is an indicator of various inflammatory diseases such as autoimmune disease, gastrointestinal disorders, sarcoidosis, and viral and bacterial infections. It also occurs in patients with cancer and chronic conditions such as tuberculosis (Dutta P and Nahrendorf M, 2014). Monocytopenia on the other hand is the deficiency or absence of monocytes in blood circulation. Monocytopenia and mycobacterial infection (MonoMAC) syndrome is characterized by a combined absence of circulating monocytes, DC, B cells and natural killer cells (Vinh DC et al. 2010). This syndrome occurs in patients with mutations in the hematopoietic transcription factor gene GATA2 (Camargo JF et al. 2013), and is clinically manifested as nontuberculous mycobacterial infection at cutaneous sites or genital human papillomavirus infection, which has a high risk of progression to genital cancer (Vinh DC et al. 2010). Monocytes can also be beneficial or detrimental in diseases such as atherosclerotic cardiovascular diseases, liver fibrosis, Alzheimer’s disease and cancer (Yang J et al. 2014, Karlmark KR et al. 2012). Below we describe the role of monocytes in atherosclerosis, liver fibrosis, Alzheimer’s disease and tumor progression. Atherosclerosis is thickening of the arterial wall caused by accumulation of cholesterol, which leads to plaque formation and clogged arteries. It is a major risk factor for cardiovascular diseases which include peripheral arterial disease, coronary heart disease, stroke and heart attack. Inflammatory monocytes are the major cellular component in atherosclerotic plaques (Zhang D et al. 2012). It has been shown that classical monocytes accumulate in atherosclerotic plaques through recruitment via CD192, CD195 and CX3CR1, and play a major role in plaque progression, thus exacerbating the disease. They contribute to vascular inflammation in atherosclerosis by producing inflammatory cytokines and inducing T cell activation through CD40-CD40L interaction (Yang J et al. 2014). Mice deficient in CX3CR1 exhibit reduced disease severity in a mouse model of atherosclerosis, due to the reduced survival of infiltrating monocytes and macrophages (Combadie’re C et al. 2003). This indicates that therapeutic inhibition of monocyte recruitment could significantly impact atherosclerosis progression. In addition, monoclonal antibodies against CD40L reduced atherosclerosis related complications, suggesting that inhibiting monocyte/macrophage CD40 signaling in cardiovascular disease could a beneficial therapeutic strategy (Kawai T et al. 2000). Liver fibrosis is induced by prolonged challenge to the liver through hepatitis B or C infection or chronic alcoholism. This leads to deposition of type 1 collagen to the extracellular space, which ultimately impairs liver function. Mouse models of liver fibrosis demonstrate increased infiltration of Ly6ChiCCR2+ monocytes into the liver. These monocytes produce pro-fibrogenic cytokines such as IL-6 and TGF beta-1 that activate collagen producing cells in the liver, leading to enhanced fibrosis (Karlmark KR et al. 2009). Depletion of CCR2 in mice results in reduced infiltration of Ly6Chi monocytes to the liver and decreased liver fibrosis (Karlmark KR et al. 2009). This demonstrates the negative effect of infiltrating Ly6ChiCCR2+ monocytes in the progression of liver fibrosis. However, in the later stages of disease, monocytes also play a role in reducing liver fibrosis. Infiltrating monocytes can differentiate to macrophages that secrete matrix metalloproteinases (MMPs) that degrade the collagen deposit, leading to fibrosis regression (Karlmark KR et al. 2012). Alzheimer’s disease (AD) is the most common neurological disorder affecting older people worldwide. It is characterized by the presence of amyloid-beta (Aβ) plaques within the brain parenchyma. Studies have shown that Aβ can recruit monocytes into the brain (Feng Y et al. 2011). However, circulating and infiltrating monocytes have been shown to clear Aβ plaques (Thèriault O et al. 2015). Although both monocyte subsets play a role in AD, non-classical (Ly6Clow/CD14low CD16hi) anti-inflammatory monocytes more significantly contribute to the removal of Aβ plaques in AD patients and mouse models of AD (Thèriault P et al. 2015). This patrolling monocyte subset eliminates Aβ microaggregates by internalizing and transporting them from the brain microvasculature to the blood circulation (Michaud JP et al. 2013). Studies have also shown however that infiltrating monocytes demonstrate impaired phagocytic capacity in AD, thus reducing their ability to phagocytose Aβ plaques (Karlmark KR et al. 2012). This indicates that the mechanisms utilized by infiltrating monocytes for Aβ plaque removal is not solely dependent on their phagocytic ability. Recent studies have demonstrated conflicting roles for monocytes in tumorigenesis and tumor clearance. Monocytes can mediate anti-tumor responses by presenting tumor-associated antigens to tumor infiltrating cytotoxic T cells (CTCs) to induce tumor killing. However, monocyte activity is often deactivated in cancers, leading to the reduced ability of monocytes to activate CTLs and secrete the inflammatory cytokines IFN-gamma, TNF-alpha and IL-12. In addition, monocytes within the tumor microenvironment demonstrate an enhanced ability to produce IL-10, an immunosuppressive cytokine (Pardoll D 2003). This demonstrates the inhibitory role the tumor environment plays on the anti-tumor function of monocytes. Myeloid derived suppressor cells, which originate primarily from Ly6Chi monocytes, also secrete IL-10 to suppress the activity of tumor infiltrating T cells. Co-culture of CD14+ monocytes with a variety of tumor cells showed that tumors express high levels of prostaglandin that also plays a role in deactivating the anti-tumor function of monocytes (Doseff AI and Parihar A 2015). Monocytes can however participate in tumor growth by promoting angiogenesis, which is a critical process in tumor progression (Lin et al. 2001). Ly6C+CD11b+ monocytes have been shown to directly promote angiogenesis through paracrine mechanisms (Yang L et al. 2004). Furthermore, monocytes expressing the Tie-2 angiopoietin receptor (TEMs), which are derived from non-classical monocytes, also contribute to tumor angiogenesis (Venneri MA et al. 2007). These studies clearly demonstrate that in the context of disease, monocytes often play dual roles and could be key therapeutic targets for disease treatment. Auffray C et al. (2007). Monitoring of blood vessels and tissues by a population of monocytes with patrolling behavior. Science 317, 666-670. Auffray C et al. (2009). CX3CR1+CD115+CD135+ common macrophage/DC precursors and the role of CX3CR1 in their response to inflammation. J Exp Med 206, 595-606. Braunersreuther V et al. (2007). Ccr5 but not Ccr1deficiency reduces development of diet-induced atherosclerosis in mice. Arterioscler Thromb Vasc Biol 27, 373-379. Camargo JF et al. (2013). MonoMAC syndrome in a patient with a GATA2 mutation: Case report and review of the literature. Clin Infect Dis 57, 697-699. Combadie’re C et al. (2003). Decreased atherosclerotic lesion formation in CX3CR1/apolipoprotein E double knockout mice. Circulation 107, 1009-1016. Doseff AI and Parihar A. (2015). Monocyte subsets and their role in tumor progression. Dr. Subhra Biswas (Ed. ), InTech, DOI: 10.5772/32615. Dutta P and Nahrendorf M (2014). Regulation and consequences of monocytosis. Immunol Rev 262, 167-178. Eis V et al. (2004). Chemokine receptor CCR1 but not CCR5 mediates leukocyte recruitment and subsequent renal fibrosis after unilateral ureteral obstruction. J Am Soc Nephrol 15, 337-347. Feng Y et al. (2011). Monocytes and Alzheimer’s disease. Neurosci Bull 27, 115-122. Fogg DK et al. (2006). A clonogenic bone marrow progenitor specific for macrophages and dendritic cells. Science 311, 83-87. Francke A et al. (2011). Generation of mature murine monocytes from heterogeneous bone marrow and description of their properties. J Histochem Cytochem 59, 813-825. Geissmann F et al. (2003). Blood monocytes consist of two principal subsets with distinct migratory properties. Immunity 19, 71-82. Geissmann F et al. (2010). 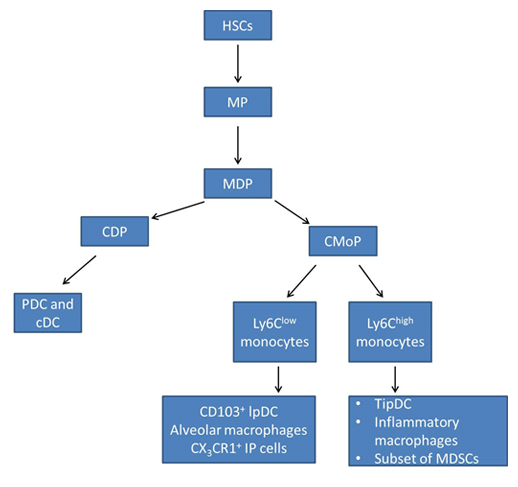 Development of monocytes, macrophages and dendritic cells. Science 327, 656-661. Ginhoux F and Jung S (2014). Monocytes and macrophages: developmental pathways and tissue homeostasis. Nat Rev Immunol 14, 392-404. Hettinger J et al. (2013). Origin of monocytes and macrophages in a committed progenitor. Nat Immunol 14, 821-830. Hijdra D et al. (2012). Differential expression of TNFR1 (CD120a) and TNFR2 (CD120b) on subpopulations of human monocytes. J Inflamm (Lond) 9, 38-43. Indramohan M et al. (2012). Inflammatory monocyte recruitment is regulated by interleukin-23 during systemic bacterial infection. Infect Immun 80, 4099-4105. Jia T et al. (2008). Additive roles for MCP-1 and MCP-3 in CCR2-mediated recruitment of inflammatory monocytes during Listeria monocytogenes infection. J Immunol 180, 6846-6853. Karlmark KR et al. (2009). Hepatic recruitment of the inflammatory Gr1+ monocyte subset upon liver injury promotes hepatic fibrosis. Hepatology 50, 261-274. Kalmark KR et al. (2012). Monocytes in health and disease- Minireview. Eur J Microbiol Immunol (Bp) 2, 97-102. Kaufmann A et al. (2001). Increase of CCR1 and CCR5 expression and enhanced functional response to MIP-1α during differentiation of human monocytes to macrophages. J Leukoc Biol 69, 248-252. Kawai T et al. (2000). Thromboembolic complications after treatment with monoclonal antibody against CD40 ligand. Nat Med 6, 114. Ley K et al. (2007). Getting to the site of inflammation: the leukocyte adhesion cascade updated. Nat Rev Immunol 7, 678-689. Lin et al. (2001). Colony-stimulating factor 1 promotes progression of mammary tumors to malignancy. J Exp Med 193, 727-740. Mack M et al. (2001). Expression and characterization of the chemokine receptors CCR2 and CCR5 in mice. J Immunol 166, 4697-4704. Meuret G et al. (1974). Kinetics of human monocytopoiesis. Blood 44, 801-816. Michaud JP et al. (2013). Real-time in vivo imaging reveals the ability of monocytes to clear vascular amyloid beta. Cell Rep 5, 646-653. Nathan CF (2008). Metchnikoff’s legacy in 2008. Nat Immunol 9, 695-698. Pardoll D (2003). Does the immune system see tumors as foreign or self? Annu Rev Immunol 21, 807-839. Peranzoni E et al. (2010). Myeloid-derived suppressor cell heterogeneity and subset definition. Curr Opin Immunol 22, 238-244. Robbins CS et al. (2012). Extramedullary hematopoiesis generates Ly-6Chigh monocytes that infiltrate atherosclerotic lesions. Circulation 125, 363-374. Serbina NV et al. (2008). Monocyte-mediated defense against microbial pathogens. Annu Rev Immunol 26, 421-452. Shi C and Pamer EG (2011). Monocyte recruitment during infection and inflammation. Nat Rev Immunol 11, 762-774. Stefater JA et al. (2011). Metchnikoff’s policemen-macrophages in development, homeostasis and regeneration. Trends Mol Med 17, 743-752. Swirski FK et al. (2009). Identification of splenic reservoir monocytes and their deployment to inflammatory sites. Science 325, 612-616. Tacke F and Randolph GJ (2006). Migratory fate and differentiation of blood monocyte subsets. Immunobiology 211, 609-618. Tacke F et al. (2007). Monocyte subsets differentially employ CCR2, CCR5, and CX3CR1 to accumulate within atherosclerotic plaques. J Clin Invest 117, 185-194. Tsou CL et al. (2007). Critical roles for CCR2 and MCP-3 in monocyte mobilization from bone marrow and recruitment to inflammatory sites. J Clin Invest 117, 902-909.
van Furth R and Cohn ZA (1968). The origin and kinetics of mononuclear phagocytes. J Exp Med 128, 415-435.
van Furth R and Sluiter W (1986). Distribution of blood monocytes between a marginating and a circulating pool. J Exp Med 163, 474-479.
van Furth R et al. (1972). The mononuclear phagocyte system: a new classification of macrophages, monocytes, and their precursor cells. Bull World Health Organ 46, 845-852. Venneri MA et al. (2007). Identification of proangiogenic TIE2-expressing monocytes (TEMS) in human peripheral blood and cancer. Blood 109, 5276-5285. Vinh DC et al. (2010). Autosomal dominant and sporadic monocytopenia with susceptibility to mycobacteria, fungi, papillomaviruses, and myelodysplasia. Blood 115, 1519-1529. Xu Z and Jin B (2010). A novel interface consisting of homologous immunoglobulin superfamily members with multiple functions. Cell Mol Immunol 7, 11-19. Yang l et al. (2004). Expansion of myeloid immune suppressor Gr1+CD11b+ cells in tumor-bearing host directly promotes tumor angiogenesis. 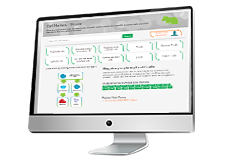 Cancer Cell 6, 409-421. Yang J et al. (2014). Monocyte and macrophage differentiation: circulation inflammatory monocyte as biomarker for inflammatory diseases. Biomark Res 2, 1. Zhang D et al. (2012). Severe hyperhomocysteinemia promotes bone marrow-derived and resident inflammatory monocyte differentiation and atherosclerosis in LDLr/CBS-deficient mice. Circ Res 111, 37-49. Ziegler-Heitbrock L et al. (2010). Nomenclature of monocytes and dendritic cells in blood. Blood 116, e74-80.